Seventeenth in an expert series on must-read books. Comment remains one of my favourite journals, publishing thoughtful pieces on a wide variety of subjects, often asking how best to think as Christians and what practices emerge from our reflections about God's redemptive work in the world. Readers care about a lot of stuff, and want to learn how to live in these times fruitfully and faithfully. Of course, as a bookseller, it is a joy to talk about books that might be of interest to this exact sort of engaged, open-minded, and discerning reader. Here are a few choice titles that Comment readers might enjoy. Comment readers are surely aware of many good resources on developing a faithful and robust view of work. From its earliest days, Comment has lamented the ways our Western culture (not to mention most Western churches) has failed to offer a truly helpful approach to the work of our hands. Paul Stevens, long-standing professor at Regent College in B.C., has been one of the best voices and most steadfast allies in the effort to educate about the meaning and dignity of labour. He is known for good books like The Other Six Days, Doing God's Business, and, last year, the very helpful Taking Your Soul to Work: Overcoming the Nine Deadly Sins of the Workplace. 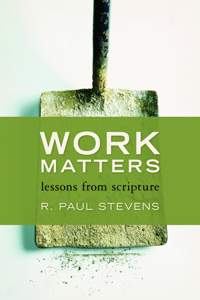 Stevens's new book is gleaned from hundreds of workshops, lectures, sermons, and classes where Stevens has offered Biblical case studies of those who viewed their jobs as related to the unfolding work of God. In another person's hands, studies about "jobs in the Bible" would seem superficial at best (and betray an unhelpful view of the Bible itself). 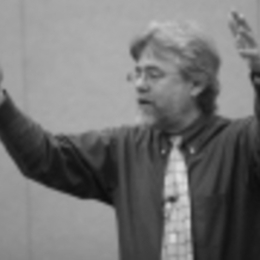 By contrast, Stevens avoids forced or cheesy interpretations, but has the eyes to see remarkable insights in stories as familiar as Joseph in Pharaoh's empire and Daniel exiled in Babylon, and as freshly interesting as Bezalel and Ezekiel and the "enigmatic" professor in the wisdom literature. He visits Ruth to teach about "survival work," David to ponder "royal work," and Martha to esteem "contemplative work." I can hardly think of a better small group study or adult Christian education resource that combines insightful Scripture reflections and helpful application as we think about our work as integral to God's mission in the modern world. Discussion questions are included. Highly recommended. So famous and influential is the late 19th and early 20th century Dutch theologian, cultural activist, and statesman Abraham Kuyper that we now find it common in some circles to refer to one's faith orientation as "Kuyperian." Those of us who admire Kuyper will surely find this lovely little volume a delight and an inspiration. 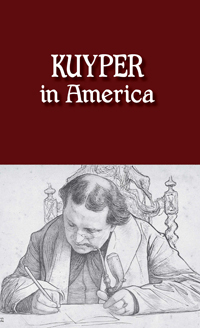 Kuyper was known as a world traveller, and his nearly six-month visit to the United States in 1898—which got him in some trouble in his homeland as he missed the inauguration of Queen Wilhelmina—is here revisited by way of the many letters he wrote from North America. Most of these are written to his wife, Jo, and their seven children. They are often quite personal, some are quite touching, and a few are laden with reformational zeal and great cultural insight. Most are not long; they are typical "travel letters" as he tells of banquets hosted in his honour (speaking with people until 2:00 am!) and the lectures he gave (most famously The Stone Lectures at Princeton Theological Seminary). He reports to his beloved from Chicago, upstate New York, Grand Rapids, Hope College, Boston, and (yes!) his visit to the White House. The back cover calls this a petit histoire. The epistolary genre is just that, giving us a small and local history, and a good glimpse into the man, his daily observations, his ordinary concerns, and his extraordinary loves. Let it first be said that Blunt is an amazing person, a renowned teacher of leadership skills, a "worldview teacher" at the Ad Fontes Academy in Northern Virginia, an adjunct professor at Gordon Conwell, and a colleague of Steve Garber at the Washington Institute on Faith, Vocation, and Culture. I intend to review this more carefully at my own BookNotes blog, but wanted to announce its publication here. It is a wonderful, interesting, multi-faceted book, and well worth pondering—important, I think, for readers of Comment and supporters of the long-haul work of Cardus. In a nutshell—even though it does a disservice to the nuanced way in which history comes alive in Crossed Lives—it compares and contrasts leadership principles from both Jefferson and Wilberforce (who, it is fascinating to discover, corresponded a bit in their early years). Importantly, both men, giants of the 18th century, vowed to work against the evils of slavery. 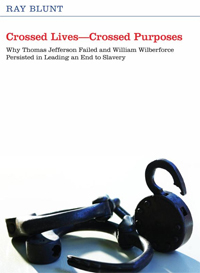 At every point, Wilberforce deepened his commitments and renewed his resolve. At nearly every point, Mr. Jefferson reconsidered, compromised, and reneged, even to the point of owning slaves. At every critical fork in the road, things happened that allowed each man to clarify his deepest convictions, to live out their worldviews, and to take up their own role in shaping politics and culture for generations. There is much to be said about the many fine points of this book and the many things Blunt uncovers about the two great leaders. One, simply put, is this: Wilberforce had real friends and substantial community and Jefferson, the consummate loner, did not. You see, it would be easy to suggest that their very different respective notions of worldview and religion explained their different lifestyles (Wilberforce was an evangelical Christian and Jefferson a philosophical Deist, and one worldview apparently provided more sustainable grounding for moral consistency). But not all with orthodox faith endured with such integrity and made history in the way Wilberforce did. Perhaps his friendships and the lack of accountability partners in Jefferson's life is part of the explanation for the way in which their lives ended up. Whether you are a history buff or a rising leader, this book will help you life a life of greater coherence, fidelity, and effectiveness. I very highly recommend it. Few contemporary Canadian writers have been as influential in the study of worldview and how the Biblical story shapes our understanding of life and times than Al Wolters, the recently retired Old Testament professor at Redeemer University College in Ancaster, Ontario. Al's careful studies of the history of exegesis, his research into the Dead Seas Scrolls, and his masterful knowledge of many languages, coupled with his experience as a philosophy professor (having earned a Ph.D. in the history of philosophy from the Free University of Amsterdam) have positioned him to be wise and fruitful in the conversations around Scripture scholarship, interpretation, and Biblical hermeneutics. In fact, he was one of the driving forces behind the important series of conferences (and hardback, scholarly tomes that emerged from them) called The Scripture and Hermeneutics Seminar, now part of the Paideia Centre for Public Theology. It is in Wolters's honour that this new collection of essays about the Old Testament is published. While collections of essays have a reputation for being more or less random assortments of chapters, readers should note that this is definitely not the case here. 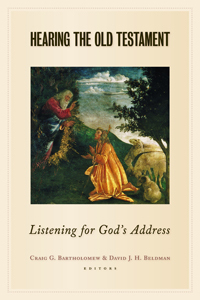 Craig Bartholomew's chapter "Listening to God's Address" proposing a trinitarian hermeneutic for the Old Testament, was written first, and all authors were asked to engage with this, whether positively or critically. The authors of the chapters in Part II, dealing with methodology, wrote in the light of this chapter; and those that wrote the chapters in Part III were asked to interact with both this chapter and the Part II chapters as they wrote. Finally, the chapter in the last section, on preaching, was written in light of the whole. All of us have continually had all chapters available to us so that we could interact with one another as the volume achieved its final form. In addition to being this well organized and uniform, Hearing the Old Testament is readable, and yet serious. This is, one might say, a "post-critical" volume—that is, they understand and engage in the latest and most serious intellectual issues, including those presented by older-school higher critics. But they do so while committed—theologically biased, as it were. Of course other perspectives and frameworks can be the starting point for others, and they affirm this "wild pluralism" of various voices these days. But they offer what they think are theologically sound, textually faithful, pastorally useful studies, allowing us to "hear" God's Word, to understand and to live out of this calling found from the God of the Hebrew Scriptures. This is an amazing volume, rich and interesting and helpful for anyone who takes God's Word seriously. It covers topics as diverse as literature, philosophy, history, insights about the canon, about spirituality, about public justice. Besides, if you are delighted that it is dedicated to Al Wolters (and includes a chapter by him) you will be that much more inclined to have it in your own collection of Bible resources. Other authors include Gordon Wenham, Mark Boda, Aubrey Spears, J. Clinton McCann, Christopher Wright, Tremper Longman, Iain Provan, M. Daniel Carroll R., and others. The books listed above are all available from Byron Borger's bookstore—Hearts & Minds Books. Why you need to get out of your own head. Fifteenth in an expert series on must-read books.